A former soldier, who now lives in Vancouver, is filing a complaint with the New Brunswick Human Rights Commission against a Moncton fitness club. Kevin Berry, 30, served in Afghanistan and says he suffers from post-traumatic stress disorder. 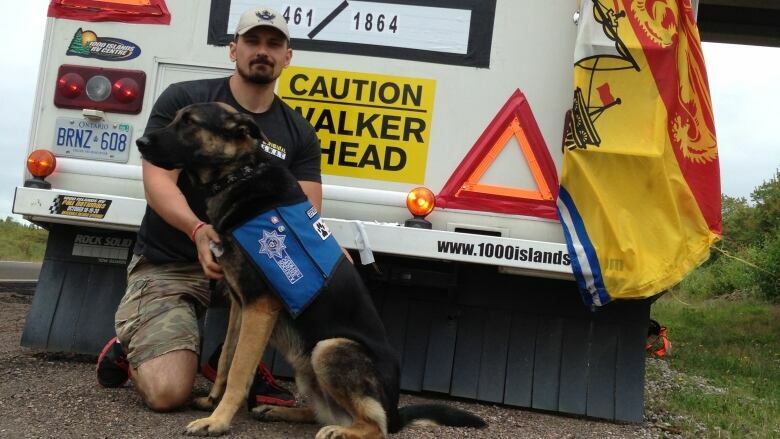 He travels with his service dog Tommy to help him cope with his PTSDsymptoms. "Tommy wakes me up during nightmares, Tommy walks in and clears my house when we get home," said Berry. Last week, Berry and Tommy were passing through Moncton as part of a walking tour between Nova Scotia and Ontario to raise awareness about post-traumatic stress disorder. Berry says they went to Global Gym on Mapleton Road so he could work out, but were denied entry even though Tommy wears a service dog vest and comes with a government-issued ID card. "They never once asked what Tommy was for," said Berry. "It was, `No,' right away." Berry says after being denied entrance by a club employee, he contacted the gym's owner by telephone. He says the man laughed at him and said he'd never allow pets at his gym. "My human rights were violated by the staff at Global Gym and the ownership," said Berry. "It wasn't just the injury, [there was] definitely an insult aspect to it after speaking with the owner on the phone." Berry intends to file a complaint of discrimination with the New Brunswick Human Rights Commission. "I have every intention of pursuing a human rights complaint with the government of New Brunswick," he said. "That's unacceptable. "You don't discriminate against disabled people," he said. "If they were going to sell me a day pass, it's open to the public and you can't restrict someone from joining because they have a disability that requires certain medical equipment." Berry served with the 3rd battalion of the Royal Canadian Regiment in Kabul in 2003-04. He was diagnosed with PTSD in 2010, six years after leaving military service. ``It's an invisible disorder, right?" he said. "You can see it on a [CT scan] or MRI, but there's not too many people that [get CT-scanned] or MRI'd before they go to a war zone to get a baseline to compare it to." Berry has been working with Tommy since January. The dog has been living with him full time since May. "He'll stick his head in the shower, goes everywhere with me," said Berry. "He is … an extension of my body. He's everywhere with me. "Tommy means life," he said. "Tommy is hope, a better life, an acceptance in society, an ability to go out and interact in a way I wouldn't have before," said Berry. "I feel safer with Tommy, much, much safer," he said. "He's there if I have a panic attack, he'll nuzzle into me. He's in tune with my emotions and knows when something is starting." The employee who denied Berry said she didn't know that some people with PTSD use service dogs and said allowing dogs at the club would have bothered other members. The owner of Global Gym did not return calls to CBC News.